Thank you for your interest in making a donation to Save A Dog, Inc.
Save A Dog, Inc. is a non-profit, charitable 501 (c)(3) organization, and all contributions are tax deductible. Because Save A Dog is in all-volunteer organization your generous donation goes directly to the dogs. On September 18th we received an urgent request from our rescue partners in St. Thomas to receive as many dogs as possible who were being airlifted off the Islands. With hurricane Maria bearing down on the already damaged Humane Society of St. Thomas, time was of the essence. Our volunteers sprung into action and drove down to Virginia Beach, where the plane carrying 150 rescued dogs landed. We came back with 23 dogs and with the help of other local shelters we were able to get everyone fed and cared for and vetted. I’ve never seen so many happy tails wagging despite their long journey to safety. We want to thank the St. Thomas volunteers who slept in the damaged shelter so that the dogs would not be harmed while waiting for their flight to freedom. As you know it is important to quarantine any incoming dogs for a few days to ensure the health of the entire shelter population. We’re asking for funds to help with additional quarantine space. We have plans in the making to put up another building, but right now we need something quick like a mobile office or an empty trailer that we can quickly retrofit into isolation space for the new arrivals. We can take many more, but we lack the space right now. If you can donate any amount, you will be instrumental in helping us save lives. Thank you so much for helping us with this life-saving work. Airline Sherpa Bags We need sherpa bags to transport dogs via commercial airlines. Harnesses We'd like a few seat belt harnesses for dogs. Coveralls With the new shelter we need Insulated Coveralls in a variety of sizes. We could use sizes ranging from Med through XL. Currently, they are on sale at the Work-n-Gear website. Ice Melt With all the paths and steps here at the new facility, we quickly run low on Paw Safe. 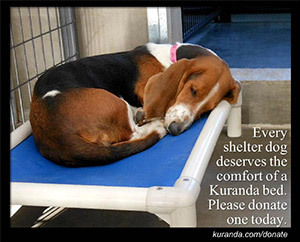 We would love to provide our dogs with a comfy Kuranda Dog bed and could use your help. If you would like to donate a bed at a special wholesale price for a another dog to sleep in comfort, please click here. Hay We are always in need of salt marsh hay to put over the muddy parts of the play yard and walkways around the quarantine area. used truck We are in need of a truck as we do a lot of hauling of crates, food, fencing, etc. Preferably not an SUV or gas guzzler, but a small pick-up would be ideal. $65 One health exam and health certificate - out of state dog. $75 Vaccinations for one adult dog. $85-100 Neuter for one adult dog. $100 Geriatric blood profile for one geriatric dog. $150 Spay for one adult dog. $200 X-rays for one adult dog. $300 Standard medical care for an incoming rescue dog (includes vaccinations, heartworm test, blood tests, worming, and spay or neuter). We currently accept online donations through PayPal. Please use the form below to indicate the amount of your donation and then click the "Make a Donation" button. $50 - will cover the cost of a Heartworm Test for one dog. $65 - One health exam and health certificate - out of state dog. $100 - will cover the cost of neutering one adult dog. $150 - will cover the cost of spaying one adult dog. $300 - will cover the standard medical costs for one adult dog. (Remember to specify a shipping address with your donation if you would like a tax receipt. Federal tax law requires us to provide tax receipts for donations of $250 or more. For donations of less than $250 you may use your cancelled check, or a print-out of the online payment receipt page). Use the buttons below to make a secure donation in honor or in memory of someone. Donations are done through PayPal, but you do not need a PayPal account to donate. Simply use the buttons below, and on the next page fill in your donation amount. A receipt for your donation is provided from PayPal. Use the form below to set up a secure monthly recurring donation to Save A Dog. Because recurring donations will be managed by PayPal, you will need a PayPal acount to set up a recurring donation. If you don't have one, don't worry, you can set one up while setting up your monthly donation. Simply use the form below to set up your recurring donation, and click on the Donate button. You will be given the opportunity to review your selections before the recurring donation is finalized. Your receipt, and the management of your recurring donation is provided through PayPal. For more information about Recurring Donations or Payments via PayPal, click here. Please make your check payable to Save A Dog, Inc. If you are making a donation to Save A Dog in honor of or in memory of an individual, please enclose a quick note containing the name and address of the individual that you would like to receive an acknowledgement card. Many companies offer a matching gift program that will increase the value of your contribution. If your employeer offers a matching gift program, please check with your benefits or human resources office to obtain the appropriate form(s). If you wish to make a donation of goods to Save A Dog, please contact us by phone at (508) 877-1407, or by email at contact@saveadog.org. We will let you know how to deliver the donation to us.